I led the team of researchers that discovered that Stonehenge was most likely to have been originally built in Pembrokeshire, Wales, before it was taken apart and transported some 180 miles to Wiltshire, England. It may sound like an impossible task without modern technology, but it wouldn’t have been the first time prehistoric Europeans managed to move a monument. Archaeologists are increasingly discovering megaliths across the continent – albeit a small number so far – that were previously put up in earlier monuments. 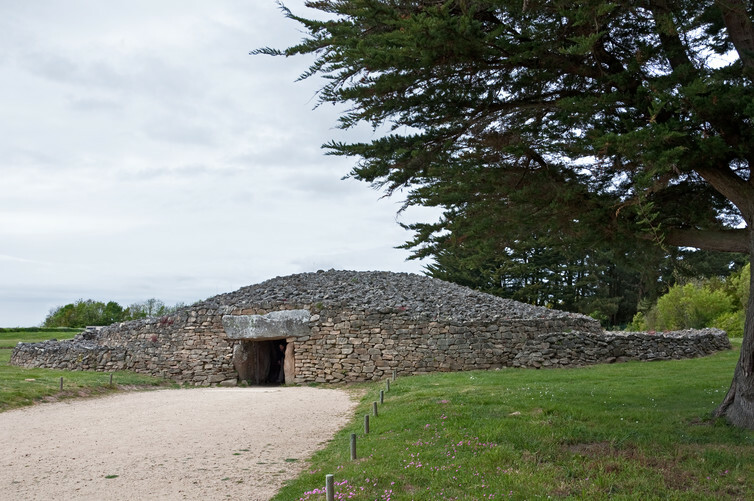 The best example of such a structure outside the UK is La Table des Marchand, a Neolithic tomb in Brittany, France, built around 4000BC. The enormous, 65-ton capstone on top of its chamber is a broken fragment of a menhir, a standing stone, brought from 10km away. The original menhir may be 300 years (or more) older than the tomb. Another fragment of this same menhir was incorporated into a tomb at Gavrinis, 5km away. This menhir, originally weighing over 100 tons, is actually one of the largest blocks of stone that we know of to have been moved and set up by Neolithic people. Another example of a standing stone reused in a megalithic monument is an anthropomorphic menhir – a standing stone carved in the form of a human figure - incorporated as the capstone of another tomb at Déhus on Guernsey. Another megalithic tomb, La Motte de la Jacquille in western France, is built of dressed stones that have been rearranged into a new tomb but it is not known if they came from a different location or were an earlier version of the tomb rebuilt on the same spot. Archaeologists have known for many years that some of Stonehenge’s bluestones (the shorter stones in the monument) were reused. Two are lintels reused as standing stones, and two others have vertical grooves that show they were part of a wall of interlocking standing stones. Until now it was thought that these were evidence of reuse just within Stonehenge which was first built around 2900BC and rebuilt circa 2500BC (at this point, large local sandstones known as “sarsen” were erected). It was then rebuilt again in around 2400BC and 2200BC. However, we identified the actual quarries in Pembrokeshire, Wales (around 3400BC and 3200BC) that the bluestones came from. This is a period before prehistoric people were building stone circles (normally dating from 3000BC onwards) so we also think it is very likely that the bluestones originally formed a rather different type of monument from a stone circle. People in western Britain and Ireland at this time were building Neolithic stone tombs known as passage tombs – Newgrange in Ireland is the best known example. So it is just possible that there is a dismantled passage tomb somewhere near the bluestone quarries. That’s what we will be looking for in 2016. An interesting outcome from a recent conference in Redondo, Portugal, on prehistoric megaliths and “second-hand monuments” is that – while some megalithic stones for monuments in Portugal and elsewhere were brought as far as 8km from their sources – the vast majority of Neolithic stone monuments throughout Western Europe were built less than 2km to 3km away from their stone quarries. So Stonehenge is a major exception to this rule, as its bluestones were dragged around 290km. This makes it unique for prehistoric Europe. How the stones were moved from Wales to Stonehenge is something of a mystery but our excavations at one of the Welsh quarries reveals that the trackway leading from the outcrop was too narrow for rollers to have been used. Instead, we think that monoliths were loaded onto wooden sledges and dragged over logs and branches laid rail-like in front of the sledge. Some archaeologists have speculated that Stonehenge’s bluestones must have been thought to have had special properties – as musical “gongs” or healing stones – for them to have been sought out from so far away. But we think it is far more likely that the bluestones were derived from quarries in close proximity to each other – within 2km to 3km – and brought together to build a local monument in Pembrokeshire. Scientific analysis of strontium isotopes in the teeth of people buried in the Stonehenge area reveals that many of them have values consistent with growing up in western Britain. So the stones may have been brought by people migrating from Wales, bringing their ancestral monument as a symbol of their history and identity. Strontium isotope analysis is currently being carried out on the people actually buried at Stonehenge when the bluestones were erected, and we await the results to see if they show a similar picture. It’s also possible that the bluestones were put up somewhere on Salisbury Plain before they arrived at Stonehenge. For example, one of the bluestones never quite made it to Stonehenge and was dug out in 1801 from the top layer of a Neolithic burial mound called Boles Barrow, near Warminster, also in Wiltshire. Although this tomb was first built around 3700BC, it seems to have gone through modifications, of which adding a layer of large stones (mostly local sarsen stones and this one bluestone) happened at the end of its use. So we don’t know precisely when it got there but it may have been set up as a burial marker before the rest of the bluestones were erected at Stonehenge. Rebuilding tombs and other megalithic structures as second-hand monuments is only now turning out to be recognised in various parts of western Europe as archaeologists start to look more closely at the detailed aspects of construction. Simple expediency of finding suitable stone does not explain sites such as Stonehenge and the Table des Marchand – they were most likely incorporating aspects of the past which had rich historical resonance for them. Can't wait for the SI results. I am sure that the rest of the article is very interesting I haven’t got past this bit yet. Anyone else find this statement bloody irritating? I am sure Mike must have been misquoted.